Home > Tesla News > Inside Look at a Tesla Model S "Teardown"
As the video above demonstrates there is a diverse ecosystem surrounding the Model S. This "teardown" provides insight into who some of the electronics companies are - especially relative to the interior electronics modules - see table below for the top 10 most costly components according to IHS. Looking into this further, there have been other past attempts to better understand the Model S ecosystem. 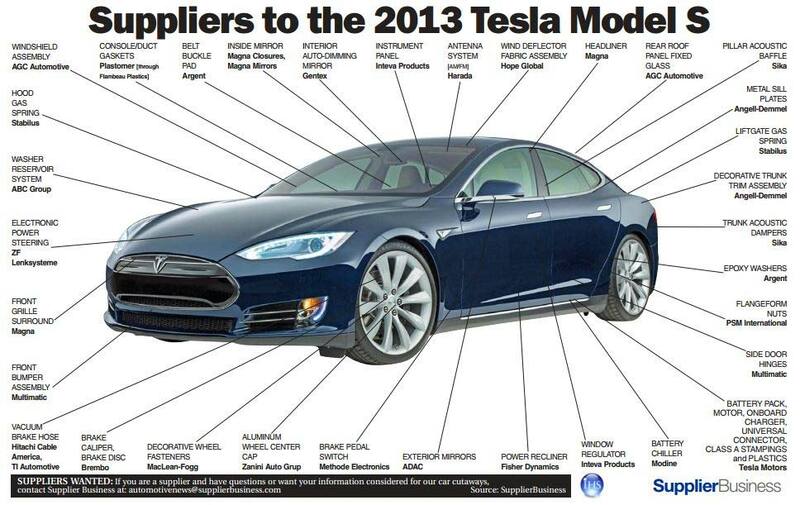 Of note, check out the infographic below to see some of the suppliers that make up the exterior and interior of the Tesla Model S.
And, further pulling the "lens" back a bit, it's intriguing to examine some of the past (and present) strategic alliances that Tesla has forged to see how they've been able to accelerate their growth, see below. This ecosystem is growing. And, as a small run family business, it's exciting - in our own small way - to present other Tesla Model S owners access to aftermarket accessories to customize and enhance their Model S. We hope the nascent Tesla aftermarket ecosystem grows so that we can offer you additional future products that can complement your Model S.